January comes with responsibilities that makes one feel like their money is not enough. Nakumatt Holdings, have got you covered. They are set to draw out more than 4,000 cheques, valued at more than Kshs. 200 million as part of their Smart Points redemption for School fees initiative. Shoppers with the Nakumatt Global card can once again get good value for their accumulated points. The cheques, will be drawn out to loyal Nakumatt shoppers wishing to redeem their accumulated Smart Points at an attractive rate of Kshs 2 per point, providing a significant School fees, relief in the New Year. As part of the retailer’s commitment, to support education development, Nakumatt will also provide a 10% added bonus for each redemption pushing the total redemption value to Kshs 2.20 per point. Speaking, when he confirmed the launch of the program, Nakumatt Holdings, Regional Director, Operations and Strategy, Mr. Thiagarajan Ramamurthy, said, “The redemption program allows Nakumatt shoppers to redeem their accumulated Smart points for School fees cheques. He also added that the cheques will be drawn to their Schools of choice”. The redemption program will run through to early February. Based on the program’s performance last year, which saw cheques valued at more than Kshs 160million drawn out, Ramamurthy, said the unique redemption programme has gained popularity as an avenue. 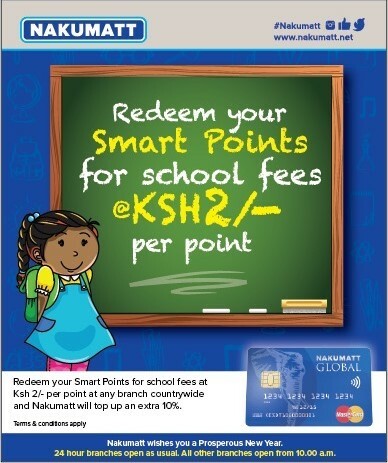 “In the true African spirit of sharing, we continue to note that most shoppers, including those who may not necessarily have School going children, redeem their points for the benefit of their family and friends and domestic workers,” he said, reiterating that all Nakumatt Smart Card holders are encouraged to routinely redeem their accumulated points at every start of a School term. “This is part of their value added benefits for shopping at Nakumatt”, he said. The more than 1.3million Nakumatt Smart Card holders enjoy numerous benefits, which include discounts, earning extra points on purchase of specific products and higher redemption value for products during offer periods. Following the 2013 launch of a new generation Nakumatt Global Prepaid MasterCard loyalty card, in partnership with Kenya Commercial Bank and Diamond Trust Bank, the retailer has been actively replacing its old generation smart cards with a new EMV compliant loyalty card. The new generation multi-currency- Nakumatt Global Prepaid MasterCard loyalty card provides a range of enhanced benefits and security features. Nakumatt Global Prepaid MasterCard cardholders also earn smart points for purchases made with the card at any of the over 35.9 million acceptance points, including 2.1 million ATMs, where MasterCard is accepted worldwide. Separator image Posted in Her money and tagged with Back to school, Loyalty points, Nakumatt, Nakumatt Global, School fees.